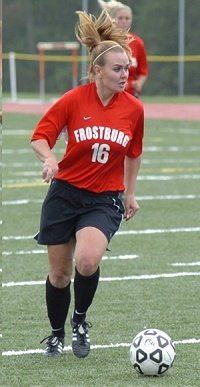 A 2005 Graduate of Hollidaysburg High School from Hollidaysburg, PA, Jackie appeared in all 83 games played by FSU in her 4-year career and was a 2-time All-Conference defender. Jackie continued at FSU as the Graduate Assistant Women’s Soccer Coach for the 2009 and 2010 seasons and earned her M.B.A. in 2011. After 4 years as an assistant coach at Adrian College in Michigan, Jackie is the first-ever head coach at Lourdes University in Ohio as they begin women's soccer as an NAIA sport. During holidays and semester breaks, Jackie continues to work as a marketing consultant for TransAct, Inc. TransAct provides strategic online and offline direct marketing to small businesses or organizations. Both my undergraduate and graduate degrees from Frostburg State have allowed me to excel in the professional world. Graduating with a Communication Studies degree and focusing in Business on marketing and public relations has proved to be very useful. Effective communication is essential in both my professional setting and as an on-field coach. Coaches need to be able to deliver a clear message to their players in order to achieve desired results in practices and games. My time playing and coaching college soccer at FSU proved to be some of the most rewarding years of my life. Working towards the goals of winning conference championships and post-season play with your teammates and best friends gave me purpose and direction. The hard work that was put in on and off the field was very rewarding and gratifying. While other students were mostly worried about the social aspects of college and sometimes struggling in classes, I was excelling in the classroom and on the field. This purpose-driven mentality has continued with me past soccer and now into post college life. The athletic staff at FSU was terrific – the athletic trainers, sports information staff, and the administration and sports coaches. It has been interesting but also very useful to me to now consider coaches I had at FSU as colleagues. Coach Parker really encouraged me to pursue my soccer and coaching education and his references, advice, and guidance have been invaluable to me.